It’s hard to remember when a smartphone was just a phone. In fact, today most people probably use their phones to send texts, images, GIFs and videos far more than to make actual phone calls. At the heart of this visual communication is the camera. On average, smartphone users take 150 photos per month* – that’s an average of five pictures every day. As the saying goes, “A picture is worth a thousand words,” so it’s no wonder so many of us prefer to communicate through this visual medium. 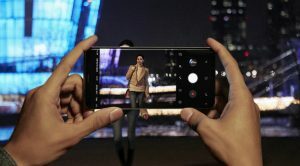 With this in mind, Samsung has reimagined what a smartphone camera should be and built a device that caters to how we use smartphones today. Here’s everything you need to know about the technology behind the Samsung Galaxy S9/S9+’s all-new camera, and how it will change the way you experience the world. At the heart of every smartphone camera is the image sensor. It registers and captures information from each subject and produces a digital image with that data. 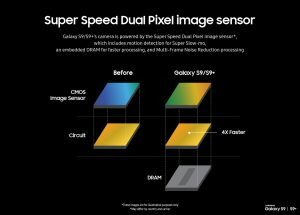 The Galaxy S9/S9+ cameras are powered by a new Super Speed Dual Pixel image sensor, which captures information in 12 million cells with a readout that’s four times faster. Because the cells are exposed to light sequentially and not simultaneously, a shorter readout time is important for reducing distortion, especially when capturing objects that are in motion. In order to accommodate this faster readout, a high-speed circuit and DRAM memory chip were built into the image sensor, creating a three-layer stack. 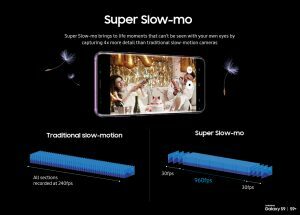 With its faster speed, the Galaxy S9/S9+’s image sensor puts in people’s hands Super Slow-mo, which delivers dynamic slow-motion video that’s four times slower than traditional slow-motion videos. Instead of capturing 240 frames per second (fps) throughout the entire recorded section, a lightning fast image sensor operates at 960fps for designated moments, delivering a burst of detail in each Super Slow-mo recording that would have otherwise been invisible to the human eye. Super Slow-mo also identifies movement with automatic Motion Detection and starts recording automatically so users don’t miss a single detail. Users can also customize their Super Slow-mo videos using two capture settings. They can either choose Single-take for one Super Slow-mo capture or Multi-take for up to 20 Super Slow-mo portions in one recording. Not only that, when playing these videos, people can add music from 35 different options or use their own tune from their favorite playlist, and easily share these recordings as GIFs with various effects – loop, reverse, or swing mode. The all-new image sensor is also what’s behind the Galaxy S9/S9+’s advanced Multi-Frame Noise Reduction. Capable of capturing more images even in poor lighting, the industry-leading low light camera can process four times as much image data as before to reduce noise and ensure that photos are clear, even in dark areas. For example, spaces with minimal lighting like elevators, corridors, and warehouses typically require at least 100 lux of lighting, but in environments with lighting as low as 1 lux, the Galaxy S9/S9+’s Multi-Frame Noise Reduction technology can still deliver sharp pictures. 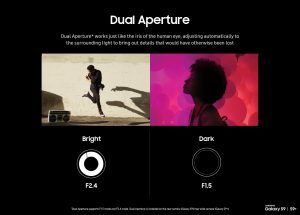 What makes shooting in low-light conditions even easier is the Galaxy S9/S9+’s Dual Aperture, which automatically adjusts to the surrounding light just like the iris of the human eye. When it’s dark, the improved circular aperture expands to F1.5 – the brightest among smartphone cameras – letting in more light. Not only that, when it’s too bright, it retracts to F2.4 to produce images that look much sharper. Instead of struggling to find the right lighting for their photos, with Dual Aperture users can seamlessly transition from one environment to another and take clear and crisp photos. For shutterbugs who want greater control over their photos, Pro-mode gives them the freedom to adjust the aperture on their own. The brighter F1.5 allows users not only to let in more light but reduce the depth of field and place more emphasis on the main subject, while with the F2.4 aperture, users can take photos that simultaneously deliver clear results for people and objects close up, as well as the surrounding background. 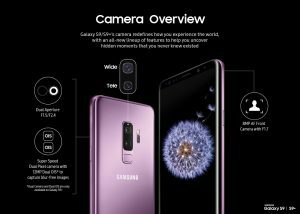 The Galaxy S9+ comes with a Dual Camera equipped with optical image stabilization (OIS) on both the wide and telephoto lens. By compensating for movements from shaky hands, Dual OIS ensures that even in 2x optical and 10x digital zoom, photos do not come out blurry. With the Galaxy S9+’s Dual Camera, users can also enjoy greater creativity using Live Focus and Background Blur. Live Focus puts at people’s fingertips the option of controlling the depth of field both in preview mode and after the photo is taken, and with Background Blur, users can choose from ten unique patterns to add to the background to make portrait-style shots stand out.